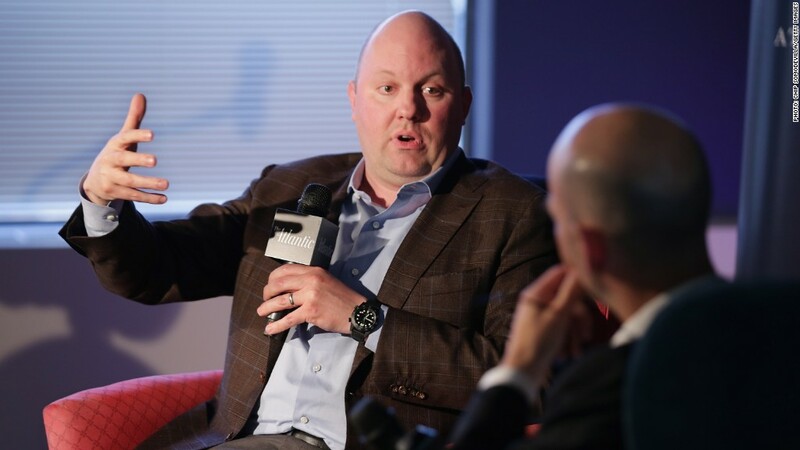 Marc Andreessen: Spendthrift startups will "vaporize"
Marc Andreessen is worried about high burn rates at Silicon Valley startups. Prominent venture capitalist Marc Andreessen has a message for Silicon Valley startups: Get your spending under control now, or fail when the market inevitably turns. Andreessen has long insisted that Silicon Valley's tech boom is not a bubble, but he is now worried that startups are spending too much cash on flashy offices or excessive numbers of employees. Andreessen's comments, made on Twitter, make him the latest in a series of investors to warn about high "burn rates" at tech startups. Burn rate measures how quickly a company uses capital. "When the market turns, and it will turn, we will find out who has been swimming without trunks on: many high burn rate [companies] will VAPORIZE," Andreessen said. Andreessen is not the only worried investor. Bill Gurley, another venture capitalist, told the Wall Street Journal last week that "no one's fearful, everyone's greedy, and it will eventually end." Fred Wilson, a partner at Union Square Ventures, is also sounding the alarm over high burn rates. Andreessen's 18 tweets on the topic warn that in the event of a downturn, companies will find it much harder to raise cash, merge or be acquired by a larger firm. When that happens, startups will be forced to adapt quickly, and bloated firms will fail. "When market turns, M&A mostly stops. Nobody will want to buy your cash-incinerating startup. There will be no Plan B. VAPORIZE," he said. Related: Have we reached a 'messaging' bubble? Andreessen said that while some companies with high burn rates will survive, they will be "few and far between." Andreessen's conclusion? "Worry," he said.